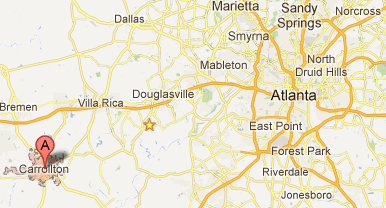 Carrollton Ga sits about 45 miles west of the Atlanta downtown area and is considered a western suburb of Atlanta. Many residents make the commute daily throughout the Atlanta area and Carrollton is a short commute to both Atlanta and Hartsfield Jackson International Airport. Carrollton is also home to many large international businesses like Southwire, Greenway Medical and Decostar to name a few. Carrollton offers an easy living lifestyle with less traffic and a slower pace than the big city but still has the conveniences you come to expect. Many great restaurants we come to enjoy like Longhorns Steak House, Ruby Tuesdays, Applebee's are favorites of ours. Also great concerts and performing arts in downtown Carrollton and in conjunction with the University of West Georgia Performing Arts Center know as the Townsend Center. Carrollton also offer a remarkable Parks and Recreations department. Featuring several sporting facilities, softball fields, soccer fields, indoor aquatics cents and the new Carrollton Greenbelt. The Greenbelt will be a running and walking mostly paved trail circling the city in a 50+ mile path. It will be the largest path of its kind in the state of Georgia and will be the model for other cities from design. Ready to check some of the properties listed on our site? Just give us a call and we will check the status, arrange for the showing and guide you through the buying process. Looking forward to working with you. 770-294-9976.